Inspired by the colourful heart of Wrocław, the shops span a total area of around 800sq m and draw on the architectural legacy of the city while offering state-of-the-art retail concepts. An official opening will take place later today. The largest outlet is a multi-category Wroclaw Duty Free shop spanning around 300sq m which has been open for some time. 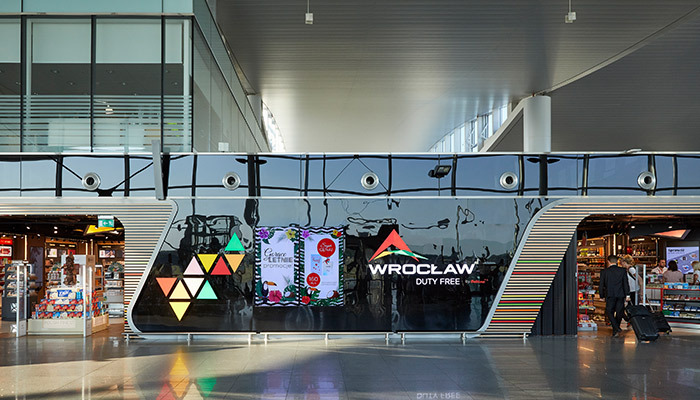 Designed with Wrocław Airport in mind, the Wrocław Duty Free brand is a modern concept offering a range of travel retail products. Travellers can choose from a selection of perfume brands, make-up products and organic cosmetics. Wrocław Duty Free also provides a selection of spirits including Polish beverages, premium spirits and regional wines, beers and liqueurs. The shop also sells tobacco, including superior quality cigars and confectionery. A Spirit of Poland concept has been introduced offering Polish products including regional delicacies from Lower Silesia. The shop provides travellers with a selection of local confectionery such as gingerbread from Oleśnica, regional deli foods, cheeses, preserves and honeys. Notable local alcohol producers include Wrocław-based brewery Browar Stu Mostów and winemaker Wzgórza Trzebnickie. A stand showcasing Baltona-branded vodka has been put up to mark the opening of the shop. Local handicraft and ceramics from Bolesławiec, a Lower Silesian brand, are also available. Meanwhile, the Wroclaw-based Fashion Boutique offers a diverse selection of fashionware and ensures an attractive product display. Highly trained staff also provide excellent customer service, according to the retailer. Clothing and fashion accessories by reputable premium brands are available in-store, complemented by the likes of Lolaandgrace, Buckley and Thomas Sabo. In response to customer expectations, the product range was expanded to include Pepe Jeans clothes in partnership with Polish brand Vistula and a line of select Polish amber jewellery supplied by Polish-based company S&A Jewellery Design. Finally, the Zoom convenience concept offers a range of Polish and international press and books. This traditional range of products is complemented by multimedia and souvenirs, including locally-themed products, such as Śląsk Wrocław football team merchandise. Local Polish offered across the various stores include E.Wedel (chocolate), Phenomé (cosmetics), Ögon Wallets (wallets), Orfin (gifts & souvenirs), Dr Irena Eris (cosmetics), CEDC (vodka) and Browar Stu Mostów (craft beer). A further statement read: “Wrocław is playing an increasingly important role in the international arena, not only as a major business hub but also as an attractive tourist destination. It wasn’t by accident the city was awarded the prestigious title of European Best Destination 2018. The stores are a perfect reflection of long-standing Baltona values, according to Kazimierski. He added: “In addition to a wide range of products tailored to suit our customers’ needs, we want to offer them a unique shopping experience that exemplifies the nature of the city. “Consequently, the spaces designed by The Design Solution are directly inspired by Wrocław, its colours and forms. Similarly, a modern and carefully selected product portfolio is supposed to reinforce the image of Wrocław Airport and make it stand out against other transport hubs in Poland. In the Spirit of Poland shop, travellers will find a range of traditional products associated with Poland and a selection of regional goods. These include confectionery, spirits, handicraft, ceramics, honeys, preserves and local cheeses. He concluded: “At Wrocław Airport, we also want to connect with more than 70 years of our history. Baltona created the Polish duty-free market and many people identify its name with duty-free shops and benefits of duty free shopping. Dariusz Kuś, CEO Wroclaw Airport, who believes the partnership will bring ‘mutual benefits,’ commented: “Wrocław Airport is one of the fastest-growing airports in Poland. The number of connections and passengers are on the rise, as are the expectations of our services. “The emergence of a new operator, Baltona Duty Free, is another attractive offer for travellers. The modern design of the Baltona shops aligns perfectly with the atmosphere of our airport and brings in a great deal of freshness. “The shops offer a wide selection of various products, from cosmetics, perfume, spirits and confectionery to luxury clothing, handbag and accessories brands. A notable example is Spirit of Poland, an outlet that sells souvenirs and local delicacies, among other products. Offering a design perspective, Nick Taylor, Design Solution Director, whose company also designed the Tallinn Airport stores, said: “The way this airport operates, passengers pass through security at ground level and the shops in departures are located on the first floor in a linear arrangement facing the gates. 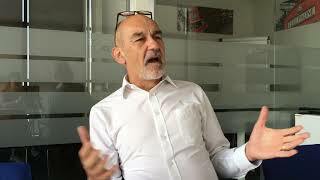 “Given the shop is not a walk-through, our first challenge was to ensure passengers were aware of the main store as early as possible and to get them to move into the shop at the initial entrance. Our strategy, when planning the shops, was to make the shopfronts as open as possible while providing enough back wall space. The Design Solution’s approach to the look and feel of the main store was to take an aspect from the character of the city and create a contemporary design.